Energy Charter is currently undergoing its modernization process aiming at the expansion beyond the OECD and former Soviet Union countries. It seems that the rules of its Treaty on investment protection and uninterrupted transit of energy are still attractive. One, who is very much interested, is China. Certainly, this cannot be a surprise bearing in mind the Chinese ambition with regard to the enormous One Belt One Road initiative. 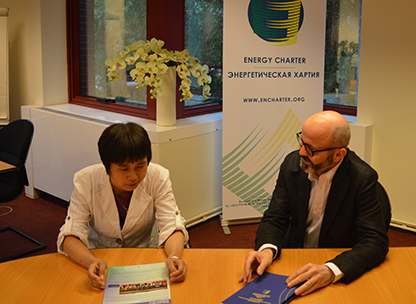 The advantages of the Chinese convergence with the Energy Charter and the accession of CNPC, Chinese energy giant, to the Energy Charter consultative body has been discussed with Dr. Matteo Barra and Ms. Han Wang, representatives of Brussels´ Secretariat of this international organization. 1. China has launched its One Belt One Road initiative supporting the rapid growth in energy related investments in the Central Asian countries (Turkmenistan, Uzbekistan, Kazakhstan) bound by the Energy Charter Treaty. What is the link between the Energy Charter (its modernisation process) and this Chinese initiative? The proposed initiative One Belt One Road (OBOR) or “Silk Road Economic Belt and 21st Century Maritime Silk Road” involves 65 countries, covering 31 existing contracting parties and outreach countries. In this context, it is all too natural that China looks at the Energy Charter Treaty for securing energy transit and energy investments, and for managing transit and investment disputes with Central Asian countries and Russia (notwithstanding termination by the latter of provisional application in October 2009). China’s signature of the International Energy Charter (IEC) and its participation as an observer to the Energy Charter Conference (EEC) is a strong signal in this sense. 2. How should the Energy Charter be modernized in order to be attractive for China? After the adoption of the IEC, countries are invited to contribute to the modernisation of the Energy Charter to meet current energy challenges. Mr. Nuer Baikeli, vice Chairman of the National Development and Reform Commission and of the National Energy Administration, expressly suggested Chinese interest in modernization of the Energy Charter towards: enhanced cooperation with emerging economies: energy dimension of the OBOR initiative; regional protocol on energy transit; broad cooperation with Chinese companies. 3. China has been certainly seeking for investment protection and for safe transit. Is the Energy Charter Treaty able to meet these expectations (even if the negotiations on the Transit Protocol were suspended in 2011)? The economic and energy transition in China (including the opening of certain energy sectors like natural gas and RES) together with the fast-growing expanding outward and inward foreign investment flows (respectively of 100 and 20 millions USD) require and justify China's accession to the Energy Charter Treaty (ECT). The provisions of the ECT can protect Chinese investors against political risk and to secure transit flows in the region of the One Belt One Road and potentially beyond (Africa, Middle East, Latin America and South East Asia, Canada). The lessons learnt from the investment disputes where the ECT indicates that the ECT is a powerful instrument to redress frustrated investors against expropriation and unfair treatment and to scrutinize host state energy law and policy. The Treaty at the same strikes a mindful balance between investors rights and sovereign powers of the host States. In addition, early warning mechanism is potentially very attractive for China in securing uninterrupted energy transit in Central Asia. In addition, the ECT provides China with the opportunity to participate to an important instrument of global energy governance. The ECT may represent to China a multilateral platform for peaceful energy relations which is essentially different from, and complementary with, other international organizations (such as for instance IEA). 4. If the ECT provides so many benefits, why China hasn’t been its contracting party yet? Of course, when it comes to sign a legally binding treaty especially concerning energy sector, Chinese government is cautious: moving towards the accession of the treaty requires on one side the modernization of certain elements of the ECT and on the other side the stabilization of the Chinese energy sector. 5. Another signal of the Chinese convergence with the Energy Charter is the membership of CNPC, its national oil and gas giant, with the Industry Advisory Panel which is a consultative body to the Energy Charter Conference. What is behind this accession of CNPC? CNPC engaged in cooperation with the Energy Charter Secretariat since 2001 and joined the Energy Charter IAP in October 2014. The Energy Charter Industry Advisory Panel (IAP) is a platform for energy enterprises willing to support international energy collaboration under the Energy Charter. At the International Energy Conference in The Hague on 21 May 2015, Mr. Baikeli expressly suggested to broaden cooperation between the Energy Charter and more Chinese companies. 6. How could the Industry Advisory Panel benefit Chinese or foreign energy enterprises investing in China? Energy enterprises and investors are direct beneficiary of the Energy Charter Treaty. Within the activities of the IAP Chinese and foreign enterprises have the opportunity to dialogue and channel their views to governments to support the improvement of the energy investment climate as well as the reduction of investment risks. In addition, the activities of the IAP can provide Chinese and foreign energy enterprises investing in China a platform to exchange information and experiences, to development collaboration, and to discuss issues of common concern. In this sense, the Energy Charter IAP is an essential element of international energy cooperation under the ECT. 7. What is the outcome of the last meeting of IAP being held in Beijing on 21 July 2015 and what are the expectations from the next, Brussels´ one (8 October 2015)? In July 2015 CNPC hosted a meeting of IAP members and invited guests, including representatives from the National Energy Administration, from the Ministry of Foreign Affairs and from the Ministry of Commerce. The meeting was concluded by a statement welcoming the participation of Chinese companies, and encouraging a closer relationship between China and the Energy Charter towards the implementation of the principles of the International Energy Charter and the accession to the Energy Charter Treaty. The next meeting of the Energy Charter IAP is expected to discuss the modernization of the IAP in order to strengthen the support of the enterprises for the Energy Charter. It is suggested that IAP meetings should be sponsored by IAP members, focused on specific topics and result in statements or recommendations to the Energy Charter Conference or to single governments. Additional suggestions include sponsoring by IAP members of researches, fellowship and training programs. Dr. Matteo Barra is legal Expert Officer at the Energy Charter Secretariat, acting as project officer for the implementation of the Energy Charter Treaty provisions promoting international energy investments and on investment dispute settlement. His main tasks include raising awareness in relation to investor state dispute settlement, monitoring energy law and policy trends in relation to foreign investment, promoting and facilitating international cooperation on energy investment. He also regularly supports to the Energy Charter Investment Group and to the Industry Advisory Panel. Prior to joining the Secretariat, Dr. Barra was an associate with the international arbitration team at a large law firm in Geneva. He holds a Ph.D. in International Economic Law (Bocconi) and an LL.M. in International Energy Law and Policy (CEPMLP). Ms. Han Wang works as a secondee in Energy Charter Secretariat focusing mainly on facilitating connection with Chinese government and enterprises. She conducts a research on about China and Central Asia energy transit, and a legal risk analysis of China’s accession of the Energy Charter. Prior to joining the Secretariat, Ms. Han Wang was deputy adviser of National Energy Administration of the People's Republic of China. Ms. Han Wang studied in North China Electric Power University Graduate School majored in power system and its automation, and was a visiting scholar in Energy System Research Centre, University of Taxes in the United States.